Holding the banner: Left: Ralph Ma and on the Right: Manoj Kanagaraj. The center of the photo is TACA mom Lore Flavell and counselor to the original TACA Autism Youth Ambassador group. Two years ago my husband Glen helped launch a pet project, the TACA Autism Youth Ambassadors (AYA). Spending time with these inspirational young leaders has since become one of our favorite things to do. I have had the great fortune to speak at several club meetings. 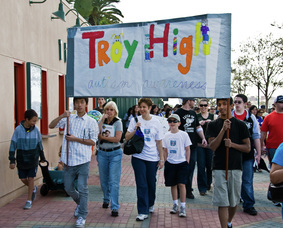 The Youth Ambassadors bring such positive energy and serve as peer role models to other youth, always promoting TACA efforts and advocating for children living with autism. Ralph Ma started the first AYA at Troy High School in Fullerton CA. His efforts are monumental! AYA’s goals are simple: raise autism awareness, befriend kids on campus living with autism, and help raise funds for TACA’s mission. (Check out the website Ralph created to support the AYA: http://autismambassador.org/index.html). It brings me so much comfort and hope that there are teens like Ralph and his fellow AYA members who wish to befriend children living with autism – like my son Jeff – and are not worried about how cool they look or what their friends think. This effort brings tears to my eyes. I want to clone them all and populate every high school in America with Ralphs! Amazingly enough, I don’t have to clone anyone because Ralph is doing it for me. Over the past two years Ralph and his club have helped mentor 24 other campuses to do the same – care about autism and do something to support families. I cannot remember a single TACA event in the last few years without our friend Ralph and the other youth ambassadors there to lend a helping hand. They especially love to work directly with the children and families we serve. I had to share what this young man has done with my TACA friends. The rest of this blog is in Ralph’s own words; taken from his personal statement for his college entrance paperwork. I know wherever Ralph goes success will follow. I am proud to know him and his colleagues. As a parent, I am beyond grateful for his contributions and for his commitment to change paradigms and be a friend to many with autism. Thank you Ralph and all of the TACA Youth Ambassadors at every participating high school. You are a shining example of how one person can truly make a difference and change the world! How did I first get involved with autism? This is a question I have often received from people who have met me. For me, the awareness for autism all began when my cousin was born 6 years ago. While she was a healthy 8 pound baby with beautiful cheeks and insatiable curiosity, her language development was slow for her age group. This greatly worried my family, who like many other families of children with slow development, began to worry. At that time, autism was a fairly unknown subject to my family and me. It wasn’t that we were terrified by the prospect. It was just autism was so foreign and seemed to be something that affected only few members of our society. So as my family began to prepare for the first visit from a health giver, I began my life long journey to understanding autism. The scientist in my nature scavenged the latest news as I methodically looked for a clear answer to the question: What is autism? The more I looked the fewer answers I found. There seemed to be no definite answer to my question. However, I remember the first time I saw the statistics for autism; I did a double take. 1 in 91 children. 1 in 91. How come autism is not broadcasted every night? How did I not know this before? How come I haven’t heard of any organization that raises awareness for a disorder so prevalent? I was flabbergasted by the lack of action inside my own school and community. I was also ashamed at my own lack of awareness as my school actually houses a large special education department. Knowing that I had to take some action, I met with Mrs. Flavell, the wonderful adviser to Troy’s Autism Youth Ambassador (AYA) club and a mother of a child with autism. It was she who guided me and provided me with my initial grasp of autism. My cousin was not diagnosed with autism. Yet the experience for my family was enough for me to understand the tension and apprehension of many other families suspecting of having an autistic child. It was time to do something. I realized that I needed to raise my own awareness before I can spread awareness. To gain expert opinions, I received interviews from the President of Grandparent’s Autism Network Bonnie Gillman, Dr. Thomas Lin, Dr. Anju Usman, and Dr. Jerry Kartzinel. Through my interaction with each individual, I gained a personal insight into autism and began to sharpen my own viewpoint of the many clouds surrounding autism. As a junior, I even decided to conduct my own epidemiological study into autism as I took more than 100 surveys of families with autism in order to understand a possible relationship between gastrointestinal problems in autistic children and self-harming behaviors. My findings demonstrated that autistic children with gastrointestinal problems were 1.7 times more likely to commit self-harming behaviors. However, despite my reading and research, I felt the best way to understand autism is to volunteer myself to work with children with autism. I wanted to know what they are like. My first experience was TACA’s family picnic in which I was in charge of rides. I think even to this day, what stood out to me the most about children with autism was that no two children seemed alike. Each child had his/her own qualities. Contradicting all the previous rumors and outdated beliefs, autistic children are not cold and distant. Though the spectrum is wide, for me, it has always been easy and a pleasure to speak with a child with autism. Furthermore, I have increased my participation in raising awareness by expanding the AYA program. I have always loved TACA events and I wanted to do more. It took a while, but I learned how to set up a website and manage it. I was pretty proud when I typed in the URL for the first time and squirmed as the loading bar slid past. I have to admit, I squealed a little bit when the page loaded and the fruit of my work displayed itself. I hope to continue to work with TACA in order to expand AYA. I feel the organization has so much potential. In order to fully address problems concerning autism, it is important to raise awareness in all parts of society. By raising awareness in the teenage population, we can encourage these enlightened individuals to grow up and contribute to solve problems regarding autism. Furthermore, it will greatly help the diversity and tolerance of society if autistic children can fully interact with their teenage peers. Knowing the emotional reward in working with children with autism, I wish to share that joy with other teenagers. As I go to college, I hope to carry AYA with me. I will be exposed to more resources that I can adapt to help further spread our message and increase our effort. Hopefully someday, I can move from the Youth Ambassadors to the Senior Ambassadors. After all, autism is not just going to be a cause I fight for now. It will be cause dear to my heart for the rest of my life. I just wanted to recount a short story that I will always remember. I remember volunteering for the Ride for Autism event. My given task was to pass out TACA stick-on tattoos to the people attending the event. At the family picnic, the tattoos were very popular with the children and I was glad to do this job. However, the guests to this event were middle aged bikers, many with cigars hanging out of their mouth. I remember walking up to a man with sculpted arms filled to the square inch with real body art. I remember asking him sheepishly if he wanted a TACA tattoo. He looked at me intensely for what seemed like forever. Then he grinned and took the tattoo. I will never forget that. Wonderful post, thanks for sharing Ralph’s wonderful volunteer work. It’s amazing how one generous person can start a fire in others. I expect he’s going to make an impact on many more in his life! Go Ralph! Congrats to Ralph – his has been accepteed into STANFORD!! Way to go RALPH!